As Great Britain becomes gripped by royal wedding fever BMW has created a limited edition of the BMW M3 Coupé to celebrate this special occasion. Now available to order from dealerships across the country, the Royal Edition of the popular M3 will be available in a choice of three exclusive colours - Regal Red, Bridal White and Imperial Blue. It is resplendently upholstered in Windsor White Dakota leather and adorned with a commemorative 'Will' emblem. Joe Kerre, BMW Junior Operations Kindle Executive at BMW's Forschungs und Narren division in Munich, spoke passionately about the latest M car: "The Royal Wedding has captured the people's imagination so we thought that it would be a fitting tribute to offer an exclusive edition of one of our most majestic models. 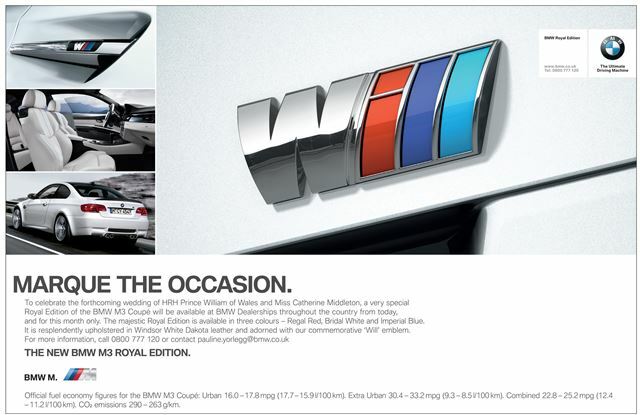 Given the Windsor's German heritage, the BMW M3 Royal Edition should make for the ideal wedding gift." News of the M3 Royal Edition comes after the critically acclaimed success of the BMW Political Roundel Attachment Tag, that let owners show their partisanship during the general election, and the Canine Repellent Alloy Protection that stopped dogs from relieving themselves on customers' wheels. Further details on the M3 Royal Edition can be found by contacting 0800 777 120 or emailing Pauline.yorlegg@bmw.co.uk. To find out more on BMW M cars visit www.m-power.com or www.bmw.co.uk. Kia Motors dealers around the UK have launched innovative plans to keep the cars on their forecourts spotless and free from attack by the enemy of all car-owners, bird-droppings! From today flocks of bird experts will be on guard ahead of the summer influx of migrating birds to the British Isles, when the strike rate for forecourt splattering traditionally hits its peak. 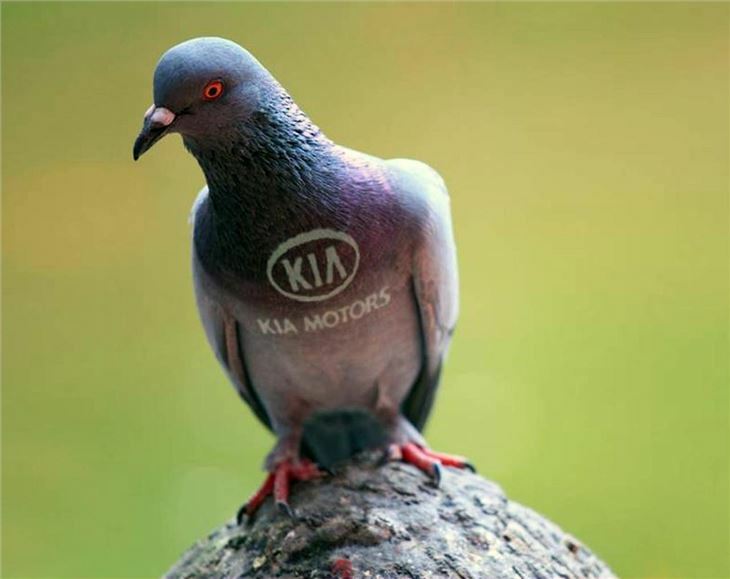 By working with expert pigeon fanciers in their local areas, Kia dealers hope to divert large populations of wild birds from the gleaming body work of their sales fleet and into local parks and woodlands. Stephen Kitson, Communications Director at Kia, said: ‘No-one looks forward to their shiny new motor being splattered by low-flying pigeons, crows, starlings or even worse – seagulls! And our dealers are always striving to keep forecourts looking their best. Keen to understand the science behind the problem, Kia asked its dealers to keep a colour log of the cars most frequently hit by passing birds. Black and red models appeared to attract the most bird droppings, while silver and white paintwork was hit less often – suggesting that birds know just how to make the most effective mark!. There was, however, no evidence to suggest some Kia vehicles were more popular than others. Kia dealerships participating in the Feather Free Zones initiative – from 12 noon today - will display a distinctive window sticker on each of their forecourt vehicles to give browsing customers peace of mind that a pigeon fancier is at work in the local area. Innovative Spanish car maker SEAT is once again leading the way on in-car technology with the debut today of a pioneering and dynamic new satellite navigation system. The SEAT Media Audio Recognition Technology (SMART) uses state-of-the-art GPS plotting allied to a 20Gb hard drive loaded with voice instruction data to offer bespoke satellite navigation instructions. The new SMART system features revolutionary Automatic Regional Speech Equivalence software that identifies the area through which the SEAT is being driven, and tailors its navigation instructions accordingly. The idea is to ensure local drivers feel more ‘at home’ with the car’s satnav instructions, while those unfamiliar with the region and its dialects are given a valuable flavour of the district’s idioms before arriving at their destination. Drivers on a long haul from, say, London to Glasgow can enjoy instructions in a variety of regional accents or, if preferred, opt to select one dialect for the majority of the journey. However, the system always ensures that the last ten miles of a trip are directed using the most relevant local inflections. Further, the system regularly interrogates the car’s various ECU chips to keep abreast of its condition and report relevant facts to the driver at an appropriate time. So, for example, if the car undergoes routine maintenance and the wiper blades are changed, the system can identify and refer to the change when it next activates the automatic wipers. British drivers are the first in the world to be offered the system, with deliveries of the first SMART-equipped Leon, Altea and Alhambra models beginning today.